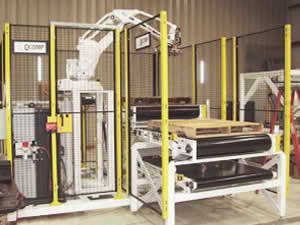 QComp has added a new heavy lifter to their Palletizing line to better meet your production needs. The newly designed Compact Lean Palletizer can handle over 100lb cases, bags, pails or trays. 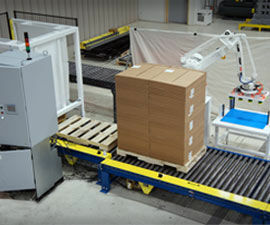 The QComp Compact Lean Palletizer is an innovative, low cost pre-engineered palletizing system which frees up valuable floor space with its small footprint. By palletizing at your point of production you will eliminate long conveyor runs to central palletizing areas. This also de-couples your production lines and allows redundancy instead of a single point of failure as in a single central palletizing system. 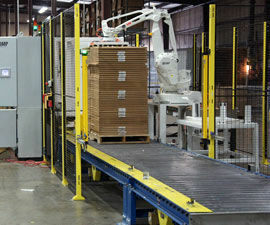 QComp designs our palletizers with modularity in mind. 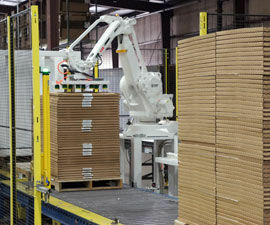 We can implement custom palletizer applications by adjusting our proven robot solutions to better fit your particular needs. 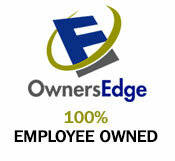 QComp will provide complete end-of-line automation including conveyors, AGV's and stretch wrapping. 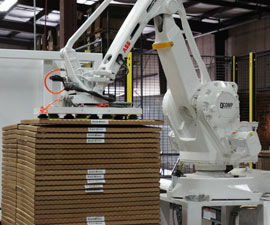 The gripper is designed to pick up one case at a time and can palletize up to 15 cases per minute. The gripper can automatically change the position of the vacuum cups to accommodate case size changes. The system can be equipped with a laser guided vehicle to bring empty pallets to the station and take away full pallets.